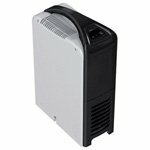 The Premiair PMDN 12DMN3 is a dehumidifier suitable for small to medium sized areas. It operates, in the way most familiar to home dehumidifier users, by condensing water vapour from the air on to a cold coil within the unit. It incorporates a compressor, evaporator and condenser coils, for the refrigeration system and a fan to draw air into the dehumidifier and to return dry air into the room. Dehumidifiers which use a refrigerant process are noted for being noisy and heavy. The noise comes mostly from the fan, with some contribution from the compressor. It is the mass of the compressor which is mainly responsible for the relatively heavy weight of these appliances. The PMDN 12DMN3 is notable for being both less noisy and lighter than many refrigerant dehumidifiers of comparable power. It is also a small dehumidifier, with a modest foot-print and would be suitable for areas where floor space is limited, such as a one bedroom apartment. The Premiair PMDN 12DMN3 is a lower capacity home dehumidifier which is capable of removing 12 Litres of moisture per day from air at 30°C and 80% relative humidity. These are typical conditions at which dehumidifiers for the European market are tested but are not typical of the operating conditions in many European homes. Moisture removal rates fall as it gets cooler and also when the air is drier. In the conditions in which most of us use these appliances the rate may be anything from one half to one quarter of the stated figure. This does not indicate that there is a fault in the dehumidifier. The PMDN 12DMN3 is rated by the manufacturer as suitable for an area of up to 17m2 which is a surer guide to the capacity of this dehumidifier. The water removed from the air drips into a water collection container, often called a "bucket". The bucket will hold up to 1.5 Litres which is relatively little. It is likely that the bucket will need to be emptied about twice a day, although this may vary according to the conditions. Dehumidifier users often complain that the bucket in their unit is too small. It should be borne in mind that the larger the bucket the larger the dehumidifier and that users also prefer smaller sized dehumidifiers. Once the bucket is full the dehumidifier automatically shuts down until it is emptied so it will not over-flow. An indicator light on the unit will glow to draw attention to the need to empty the bucket. If emptying the bucket is a chore too many, or simply inconvenient, the Premiair PMDN 12DMN3 may be set up for continuous drainage. A plastic blanking plug is located at the side of the dehumidifier, approximately half way from the top of the unit. This may be removed and a drain hose of 16mm diameter attached to the outlet. The other end of the hose should be placed in a drain and with this arrangement in place the water will be discharged to the drain as it is collected. The drainage feed is by gravity alone, there is no pump to assist the flow. The hose must be sloping downwards all the way to the drain and all parts of it must remain at a lower level than the outlet from the dehumidifier. If this is difficult to achieve you may find it helpful to mount the unit on a surface a few feet above floor level. The operating temperature range for the Premiair PMDN 12DMN3 is 5°C to 35°C. This is the range in which the dehumidifier can operate without damage to its working parts. It should not be taken to indicate that this dehumidifier will provide effective service at consistently low ambient temperature. Most dehumidifiers have an auto-defrost function and the PMDN 12DMN3 is no exception. Refrigerant dehumidifiers remove moisture by condensing water vapour on to a cold surface. To make the surface cold they incorporate a refrigeration system to cool that surface. Even at room temperature, around 20°C, ice begins to form on that surface. As ice builds up it reduces, and eventually prevents, further condensation. Once this happens the dehumidifier has to stop until the ice has melted. There are two types of defrosting systems, active and passive. An active defrost system applies heat to the iced surface, usually as a flow of warm air, and quickly melts the ice. This system is often referred to as "hot gas defrost". A refrigerant dehumidifier with this system will perform effectively at low temperatures, down to a few degrees above freezing. Passive defrost simply waits for the ice to melt, aided only by the flow of air drawn in by the fan. The lower the ambient temperature the longer the ice takes to melt, so the colder it is the less work the dehumidifier will do. This is the system fitted to most home dehumidifiers, including the Premiair PMDN 12DMN3. It is perfectly adequate for use in the living areas of a home but will not give good results in cool areas, such as a garage or an unheated cellar. The Premiair PMDN 12DMN3 is a compact unit measuring just 32.5 x 15.0 x 49.5cm. Its small size makes it ideal for areas where space is limited. This is also a relatively light-weight unit at 8.5kg. The modest size and weight of the PMDN 12DMN3 makes this dehumidifier truly portable and castor wheels and a top-mounted carrying handle are fitted for easy movement. In the event of an interruption in the electricity supply the PMDN 12DMN3 will start itself when power is restored due to its auto-restart feature. A washable nylon filter is installed which should be removed and cleaned at least once a month to maintain efficient operation of the unit. Perhaps the most appealing feature of the Premiair PMDN 12DMN3 is its low noise level of just 41dB when in use. Dehumidifiers are never "quiet", and we never use the term "whisper quiet", but this unit is considerably less noisy than many of its competitors.